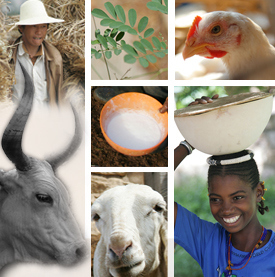 During the lifetime of the Fodder Adoption Project ILRI established local innovation platforms at various field sites around Ethiopia. The idea behind these was to provide a forum for key livestock feed stakeholders to get together and jointly plan actions to improve the livestock feed situation for smallholder farmers. One such innovation platform was established in our Ada’a site and a key stakeholder was the Ethiopian Meat and Dairy Technology Institute. In all our sites and at our national Fodder Roundtable another key actor was Eden Field Seeds, a local private seed supplier. At one of our Fodder Roundtable meetings we focused on difficulties with forage seed supply and one of the recommendations was to encourage local agribusinesses to expand and begin to take on the seed supply function from the national research system. As the Fodder Adoption Project wound up we wondered whether some of the linkages established through the local innovation platforms would last beyond the project. I was encouraged therefore when ILRI was approached by EMDTI recently to co-sponsor a forage seed field day involving Eden Field Seeds. 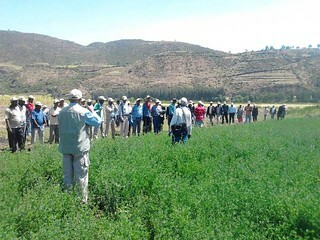 The field day was held at one of the company’s outgrower schemes associated with Ataye Prison Farm in North Shewa. The day brought together a range of stakeholders and the subsequent discussion showed that there was good engagement. You can read the field day report here. The FAP platform at Ada’a woreda brought together a number of stakeholders including private sector players like Eden Fields who continued the efforts to build a sustainable forage seed source for the increasing demand for improved livestock feeding systems in the country. It is most rewarding that Eden Field Seeds, being the only certified private forage seed supplier in the country is now active in bringing together stakeholders around forage seed supply. Tags: FAP, innovation platforms. Bookmark the permalink.